Counting death as a favor and not as a crime. And vandals thy headstone have mockingly marred." William Hickok, or as he was most generally known, "Wild Bill," was a native of Illinois, and served with credit all through the Civil War; and after participating in some fierce hand-to-hand encounters with Confederates, in which he showed remarkable bravery, he drifted West and began to play his picturesque part on the wild frontier. While Tom Smith and others made lasting reputations as marshals in the days of gun fighting their fame was as nothing in comparison with that of Wild Bill Hickok, for the reason that Wild Bill had in him just that dash which ever crowns the hero. Hickok was a man a little above medium height, and lithe and muscular build. He had broad shoulders and a tapering waist, the latter being accentuated by a black coat and a low cut vest, the top button of the latter garment being always open. Tucked inside this vest were the weapons which were the foundation of Wild Bill's reputation, and which sent many a clever gunman to the famous Boot Hill for burial. His face was long and of a determined case, with a long, silky mustache, dropping over a hard-set, but not cruel mouth. His nose was aquiline, and this, with his piercing blue eyes, gave his face the indefinable stamp of determination that awed many an ambitious bad man. Long, shining curls of chestnut hue swept down to his shoulders. And when this picturesque figure, under a broad-brimmed hat of white felt, strode down the street in any festive cow-town or mining camp, cowboys and miners pitched their revelry in a low tone, and the bullies who were wise were careful to refrain from "starting anything." Hickok was a young man when he received a commission as a deputy United States Marshal, and was assigned to particularly dangerous duty in Western Nebraska, when that country was a terror to all law-abiding citizens. There had been many murders and strange disappearances of immigrants reported from that section, and it was suspected that a gang of murderers had made a practice of intercepting the wagons of travelers, killing the immigrants and stealing the contents of their outfits. Wild Bill and a partner undertook to ferret out these criminals. They took up their abode as settlers in a cabin on the banks of the Platte River, near the scene of several disappearances, and they became convinced that the work had been done by a crowd of bad men, known as the McCandless gang. There were a number of McCandless brothers in the gang, and with two or three outsiders, it made a formidable combination. Wild Bill merely waited for something on which to base a move before arresting the ringleaders of the crowd. He had not long to wait, for McCandless brothers were shrewd and suspicious men, and they suspected that the coming of these two quiet strangers boded no good to them. They were particularly suspicious of the one with the shining curls, who had given evidence of astonishing skill with the revolver. They planned to kill Wild Bill and to prove their suspicions afterwards. Accordingly, they moved on Wild Bill's cabin one day when the deputy's partner was away fishing. There were seven in the party, all well armed, and such a thing as defeat never entered their calculations. Bill heard them coming, and divining their purpose, immediately opened fire. Two of them fell dead outside the cabin door. The others rushed in firing, but Wild Bill stood behind the table, with both revolvers speaking in rapid unison. Two more fell inside the door, and a fifth staggered to the table so desperately wounded as to be clear out of the fight. Bill was seriously wounded, but soon only the old man McCandless was left. This leader of the gang was a desperate and resourceful fighter, however, and he closed with Hickok in a struggle to a finish. Both had their knives drawn, and they hacked and stabbed each other desperately as they rolled about the cabin floor. When Wild Bill's partner came back from his fishing, he found Bill and old man McCandless locked in a deadly embrace in the middle of the floor. The old man was stabbed through the heart, and Wild Bill was all but dead from the loss of blood. Two of the McCandless gang lay groaning, mortally wounded, and the others were just where they had fallen—mute tribute to Wild Bill's deadly aim. Hickok recovered from his wounds, and his fame from this encounter spread all over the West. He wandered about the frontier, being marshal of many of the wickedest towns. He was in this capacity forced to kill many persons for the reason that gunfighters from all over the West sought him out for the purpose of slaying him. They had no grudge against him, but merely wished the glory of killing the greatest gunfighter of the day. They took pot shots at him from behind doorways, or fired into the open doors of saloons as Wild Bill stood talking. But always their shots went wild, and always Bill's leaden answers were effective. He was unquestionably the most daring and expert gun-man the Great Plains ever produced—far superior to Buffalo Bill, so extensively advertised. An instance of the constant danger to which Wild Bill was exposed was shown in Dodge City, Kansas. Bill was in a saloon, talking to the barkeeper, when a man pretending to be drunk, shambled in to within a few feet of him. Then the fellow straightened up, flashing a revolver which he held within a few feet of Bill's breast, exclaimed, jubilantly: "Now, Wild Bill, I've got you." Without moving his hand from the bar or his foot from the rail, Wild Bill gazed over the man's shoulder, and said, as if addressing some one in the rear: "Don't shoot him in the back." 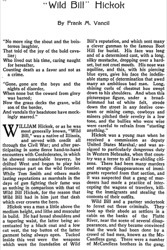 Fearful of being shot in the back by one of Wild Bill's friends, the man naturally turned his head an instant, and that instant was sufficient for Bill to draw and shoot him through the heart. As the man fell, Wild Bill replaced his hand upon the bar and calmly went on talking, as if nothing had happened. But for his wonderful quickness of thought, as well as of hand, he would have been shot dead in another instant. 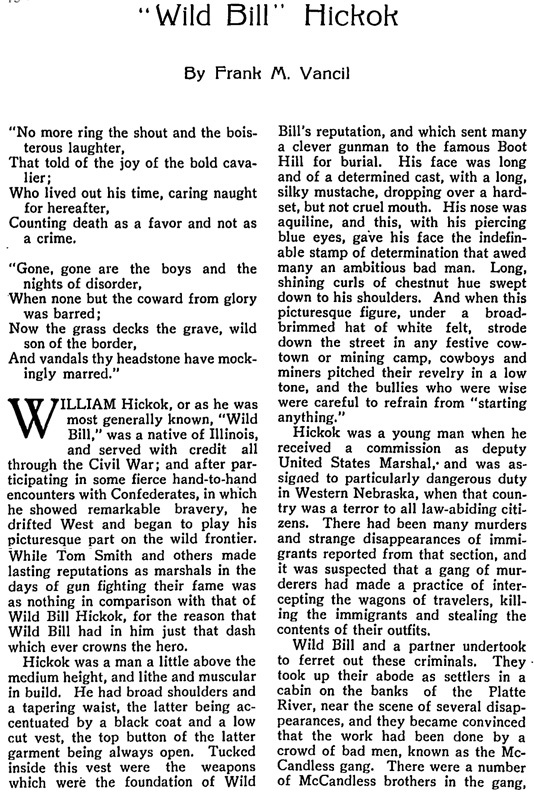 But such daring and eventful characters generally die "with their boots on," and such was the fate of Wild Bill. He followed the rush to the Black Hills and located in Deadwood. Some of his old enemies went also, and camped on his trail. While sitting in a saloon, engaged in a social game of cards, with his back to the door, an unusual thing as to position, he was shot and killed instantly. The would-be hero was run down, convicted of murder and hanged. The grave of the most famous marshal and most ruthless of man-killers of the old frontier days is chief among the show places of Deadwood, S. D. Relic hunters have sadly despoiled the monument at the head of the grave. The marble bust has been chipped and marred until the features are scarcely recognizable. Deadwood proposes to replace the battered monument with a big shaft of marble, something that will endure for all time, and that will show posterity just what the city thought of the man who, more than any other man, put an end to the lawlessness on the frontier.